Where are the screaming girls? 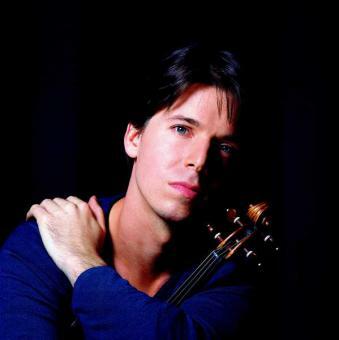 Joshua Bell – hotter than Justin Bieber! Long shining hair falls across the musician’s face as he sways to the music he is creating. His tight-fitting khaki-colored T-shirt is sweat-drenched from his exertion. He holds his instrument as if it were an object of passion, eyes half-closed. The back-up group struggles to match his intensity. There are plenty of teen-age girls in the audience – why aren’t they screaming, fainting, calling out his name? Because this is not Justin Bieber or Enrique Iglesias – this is Joshua Bell, the former teenage violin prodigy, belting out Glasunov’s violin concerto in A minor, opus 82 in open rehearsal with the San Francisco Symphony (October 5, 2011). Unlike Gene Simmons of Kiss and others like him, Joshua Bell does not end each concert by smashing his violin. It is as famous as he is in certain circles – the 1713 Gibson ex Huberman Stradivarius, twice stolen , recovered the second time after a deathbed confession by the thief, and purchased by Bell and his backers for something around $4 million. The history (and the price tag) elicits a certain amount of respectfulness not conducive to screaming. As a rule, classical musicians don’t get to wear cool duds. If I had seen Joshua Bell in concert instead of in open rehearsal, his muscular shoulders and narrow hips would likely have been effectively masked in dowdy concert wear – those white-tie and tails were great for Fred Astaire, but in those days the sweat wasn’t supposed to show. I realized after a casual conversation with the adjacent well-dressed rehearsal-goer that most of the teenagers in the audience on a Wednesday morning in October were music students field-tripping with their teachers and chaperones. The non-pubescent portion of the audience were mostly silver-haired retirees of a grand-parently or even great-grandparently demeanor. If any of the teenagers had shown any inclination toward swooning, one of the grandmothers would inevitably have whipped a vial of sal volatile out of her bulging reticule and brought the young lady to her senses immediately. Add some bling to the band. Maybe you don’t want to stomp the Stradivarius, but does EVERY string instrument have to be BROWN? Ditch the ties and tails. Maybe not leather pants and sequins, but didn’t we all love Lenny Bernstein’s white turtleneck and Count Dracula capes? Unbutton the audience. Reserve the boxes and balcony for retirees, and save the orchestra area for the mosh pit. Allow social media to do its magic. What’s with the “Turn off your cell phones, no pictures” mantra? A few viral You-tube videos and real-time Tweets about what a hot presence Joshua Bell is in concert, and your symphony attendance issues would be resolved! And don’t forget to sign me up with the groupies!